Getting my mits on a commemorative copy of the Washington Post's election special edition was my obsession this week -- especially after someone swiped Wednesday's newspaper from our driveway. The Post is now selling "limited edition" copies online for $9.95, although I bought a copy for $4 from a vendor at a Metro station this evening. The Post also is selling front-page reproductions on T-shirts and coffee mugs, as well as fancy reprints that are suitable for framing. I was always surprised that last story didn't get more pick-up. 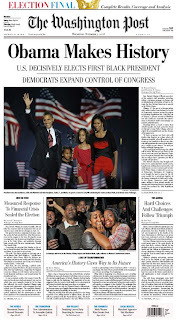 UPDATE (11/9/08): Speaking of instant history and historic Web pages, my friend Mark Potts over at Recovering Journalist posted a set of "Obama Wins" screen shots from major online news sources -- on election night, no less. In case you missed it, CNN correspondent Jessica Yellin "beamed" onto the news network's election night set from Chicago for a four-minute, live "holographic" conversation with anchor Wolf Blitzer in New York (video embedded below). Yellin explained that she was reporting from a tent near Obama headquarters, surrounded by a ring of 35 high-definition cameras that created a 3D-ish composite image of her. The cameras moved in sync with the cameras in New York, allowing her to appear on set with Blitzer. Engineers spent two weeks assembling the set up in Chicago. "It's like I've followed in the tradition of Princess Leia," Yellin (complete with a bluish outline) said. 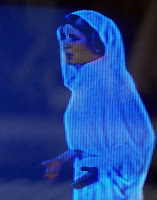 "You're a terrific hologram," Blitzer assured her. Why it was worth all the expense and trouble to have a live, on-the-scene TV report that omits the, um, scene was unclear. Clearly the gimmick is a contender for the Best Special Effects award when the "Waltys" for election coverage are handed out next year. But I am not sure it served any purpose for viewers. A quick Twitter search immediately after the segment generated a wide range of reactions, including "DUM!," "cool," "hilarious," "star warseque," "lame," "neat," "pathetic," "silly," "cringeworthy," "SIKKKK!" and "weird." So how will we see this nifty new tool used next? Sportscasters beamed into the middle of instant replays to point out a fumble? War correspondents beamed into replays of fire fights to explain the action? "The technology in play was originally developed by Israeli-based company SportVU (pronounced 'sport view') as a new way of filming soccer games. "Gal Oz, a SportVU designer who came to the United States to work with CNN on the endeavor, said it was originally designed 'to create a matrix effect in sports' -- in other words, to provide 360 degrees of perspective for instant replays. " In a segment on Blitzer's "Situation Room" Wednesday, CNN Senior Vice President and Washington bureau chief David Bohrman said he's been trying to do something like this for a dozen years. "I've basically been a crazy mad scientist trying to get it done." So does Bohrman think holocoverage has a future? "We'll see. It was a little ornament on the tree.... But television evolves, and how we do things evolves, and at some point -- maybe it's five years or 10 years or 20 years down the road -- I think there's going to be a way that television does interviews like this because it allows for a much more intimate possibility for a remote interview." It's too early to say whether the polling place issues that have emerged in the first hours of voting today will add up to serious problems in the final election counts. Among these preliminary reports you'll see that several voters in Shaker Heights, Ohio, received paper ballots that left off the presidential race. And a precinct in Raleigh, N.C., did not open on time this morning because its chief judge's grandson drove off with the ballots in his pickup truck. Mistakes will happen. But it's hard to read these and other accounts and not be amazed that people still think paper is the key to secure, fair and accurate elections. Electronic voting certainly has its problems too, but is paper the answer? I ask because my recent CQ column on the obstacles to Internet voting in the United States (reposted here last week) generated some interesting comments, mostly about online security. One writer, a former colleague of mine, asked about the online voting system in Estonia that I wrote about in the column. "How would the Estonian e-voting have gone down if had happened during the Russian cyber attack in May of '07?" he said, citing a Guardian article on the incident. "Assuming we kept something along the lines of single voting day and didn't open it up to a voting month... couldn't a denial of service attack plus a strict reading of/adherence to voting laws ('deadlines are deadlines') lead to as much or more trouble than single voter ID fraud?" My answer to this and other comments was that online voting has many potential vulnerabilities, a denial of service attack or some kind of other cyber assault among them. But our current offline systems for managing elections also are vulnerable to all manner of disruption too. The 9/11 terrorist attacks happened to be on primary day for New York City's 2001 municipal elections; voting was postponed, needless to say. That is not an argument for or against Internet voting. But the tendency to see vulnerabilities in electronic voting systems (whether online or systems at the physical polling place) as significantly different from non-electronic systems (missing paper ballots or manual manipulation of registration rolls) is interesting, if not mysterious. Any process involving humans is vulnerable, and I am not convinced that current offline election practices are especially efficient, reliable or secure. My wife and I waited 70 minutes to cast absentee ballots in Fairfax County, Virginia, one night last week. The main hold up: Election workers had to read each paper absentee voter application and call someone on the phone to verify details. Much of the time we were there, the six available voting machines were idle while the harried poll workers managed the line and the phones. Not so efficient. On the other hand, the very next afternoon the state board of elections Web site let me use my name and the last four digits of my Social Security number to verify that I had indeed applied for an absentee ballot and cast my vote in-person the previous evening. While that online confirmation message gave me great confidence that my vote had in fact been counted, others just as easily might have found it creepy. In a society in which people are perfectly comfortable swiping credit cards at kiosks to get boarding passes at airports or conduct other private-sector transactions, many Americans still seem to distrust government use of technology for equally routine purposes. That kind of anxiety may reflect more how Americans feel about government than they do about technology. It's an emotional reaction, understandable in a country built by people who largely fled other forms of government. And that innate anxiety and distrust will continue to drive our future decisions about voting systems and processes -- perhaps far more than technological considerations alone would merit.